Our girl power can help some girls who really need it! 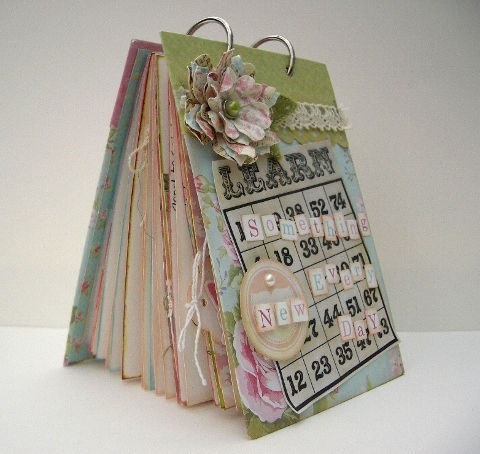 If you've ever wondered about signing up for an online scrapbooking class then today is the day to do it. For the next 24 hours Shimelle is donating 100% of her class fees to this very worthy cause, Plan-Uk's Because I am a Girl Campaign. Go HERE to read all about it and learn more about Shimelle's classes. I can highly recommend the classes, I took the 'Learn Something New Every Day' class last year and enjoyed every bit of it. Here's the album I created. I've just signed up for the 'Something for Almost Nothing' class and can't wait to get started, but there's a huge pile of washing to sort out first! Wow this is stunning Vicky, such a beautiful Album. This is a really stunning album Vicky - hope you have fun with the new class - can't wait to see what you 'learn'. What a lovely idea, does it take a long time? I like to scrapbook but I find it takes me soo long! Then I get impatient! Maybe if I had something to follow, it'd go faster? Hmmmmm? Thanks for your lovely comments on my blog too Vicky. I love your album Vicky, really must check out the link.